Heat oven to 200°F. In shallow bowl, mix 1/2 cup flour, the poultry seasoning, 1/2 teaspoon salt and 1/2 teaspoon pepper. In medium bowl, mix egg and water. Coat both sides of chicken with flour mixture; dip into egg mixture, then coat with flour mixture again. In 12-inch skillet, heat oil over medium-high heat until hot. Cook chicken in oil 14 to 18 minutes, turning once, until golden brown on all sides and chicken is no longer pink in center. Transfer to cookie sheet, and keep warm in oven while making gravy. Pour off all but 2 tablespoons of oil and drippings in skillet. Add 2 tablespoons flour, 1/4 teaspoon salt and 1/4 teaspoon pepper to oil in skillet. Cook over medium heat 1 to 3 minutes, stirring occasionally, until thickened and light golden brown. Beat in milk with whisk 1 to 2 minutes or until mixture thickens. Place chicken breasts on plates, and divide gravy evenly over chicken breasts. To keep all sides of chicken extra-crispy while making gravy, place chicken on top of rack on sheet pan to keep warm. While it may be tempting to thoroughly clean out skillet before making gravy, resist the urge. 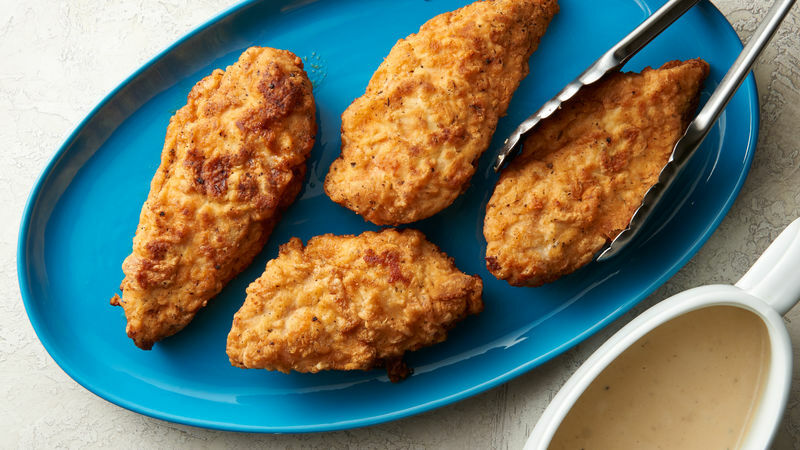 Drippings from frying chicken add flavor to gravy.